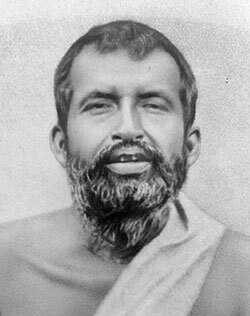 Ramakrishna (February 18, 1836 – August 16, 1886), was a famous Bengali sage and mystic of 19th-century India. Ramakrishna proclaimed the oneness of all religions and the worship of the blissful Divine Mother. Many of his disciples and devotees believe he was an avatar or incarnation of God. He is also referred as Paramahamsa by his devotees, meaning “Great Swan”. He gave everyone the freedom and power to pursue Truth along his or her own unique path. He became a priest of the Dakshineswar Kali Temple, dedicated to the goddess Kali. He began to look upon the image of the goddess Kali as his mother and the mother of the universe. He became seized by desire and longing to have a darshana (vision) of Kali—a direct realization of her reality—and believed the stone image to be living and breathing entity. From 1861 Ramakrishna absorbed at a tremendous rate the teachings and initiations of many traditions, including Tantra, Kundalini Yoga, and many Hindu philosophies, even absorbing the esoteric teachings of Islam and Christianity. Ramakrishna: O beloved friends, please listen to my words! 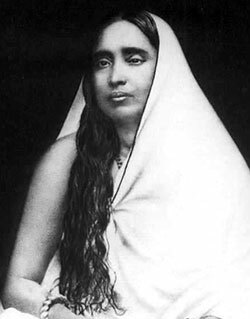 The sole purpose and goal for human life, the supreme ideal of which all other ideals are simply an expression, is to cultivate love—the most pure, passionate, intimate love that the milkmaids and cowherd boys in the green groves of Vrindavan cherished for the captivating, dark blue Krishna, the very incarnation of Divine Love. There is no boundary whatsoever to pure love—it embraces humanity and Divinity equally. In this most intense love, no sense of duality can remain. When Lord Krishna traveled to the city of Mathura to fulfill his administrative duty,’ his companions roamed the fragrant countryside, weeping with ecstatic love, their outward separation from Krishna’s beloved form further intensifying their inward union with him as Divine Presence, as Love. The radiant atmosphere of Ramakrishna’s room and its alchemical power move with him, creating the spaciousness and tranquillity of the Dakshineswar Temple Garden wherever the Paramahamsa travels to meet with lovers of God and other persons of integrity, consecrated to truth, wherever they may be. With all such persons, our Master feels intense affinity and solidarity. Today we are delighted to be in his blissful company, riding in the cab of a horse-drawn carriage through the colorful streets of Calcutta— a city of cultural and intellectual ferment and creativity, where ancient and modern currents meet, colliding and blending. The Paramahamsa is seated cross-legged in the noisy, bouncing vehicle, immersed in the profound silence which arises as his mental and perceptual faculties become aligned and are drawn like iron filings to the powerful magnet of the Absolute.